Uglyworld #778 - Cinko's Recreation Pass (257-365), originally uploaded by www.bazpics.com. 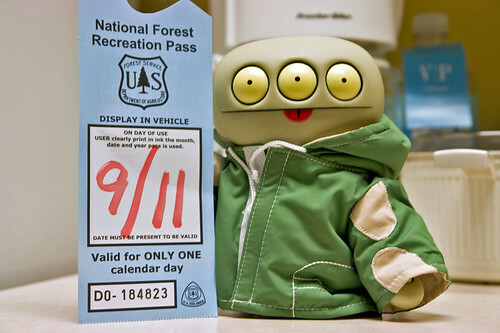 Cinko wanted to show off his National Forest Recreation Pass from last Saturday when we visited Newberry National Volcanic Monument as part of our 9/11 rememberence weekend. Cinko has already promised Wage, Babo and all the other uglies back in Germany that he'll bring back the pass as a memento of his trip to Oregon this year.